At Moduline Cabinets we are the go-to source for a variety of cabinets, including mobile ones. 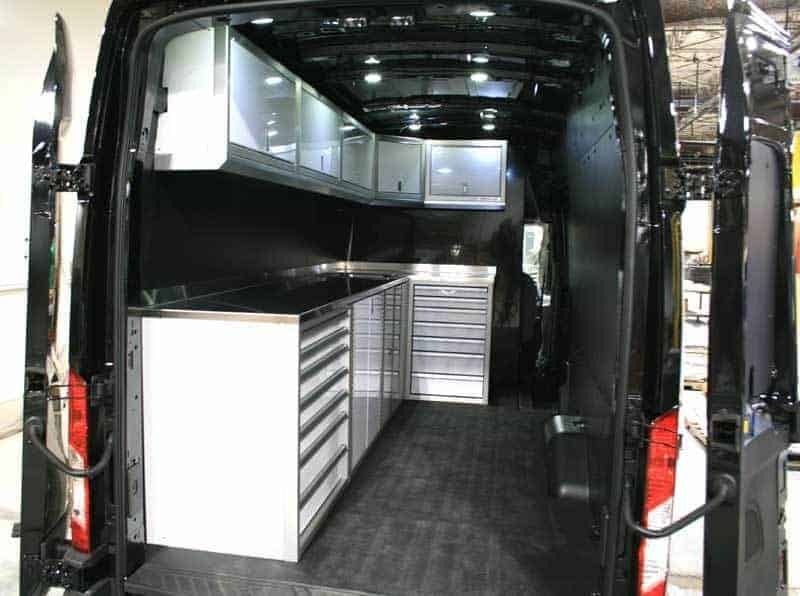 We specialize in cabinets made from lightweight, military-grade aluminum, designed to provide storage in work vehicles. No matter the type of cabinets a customer is looking for, we have the perfect solution. We’ve outfitted emergency, government, vans, enclosed trailers, V-nose trailers, and more vehicles. Our cabinets have the design, fit and durability you need. The PROII™ Series is Moduline Cabinets’ flagship model in the area of mobile aluminum cabinets. These cabinets and toolboxes are composed of a military-grade aluminum and can be tailored to meet any organization needs for your vehicle. Like all Moduline Cabinets products, these cabinets are produced with precision craftsmanship and come with a lifetime guarantee. They also come with Moduline Cabinets’ unique QuikDraw® technology. This makes it possible to keep drawers securely closed, especially in transit, even without locks. With Moduline Cabients’ revolutionary PROII™ Series of cabinets, clients have the ability to fully customize mobile cabinets and tool boxes to fit into any space. The Moduline Cabinets SPORTSMAN II™ series of mobile aluminum cabinets are the perfect option for clients who are seeking value that goes alongside quality. These cabinets are great for vehicles and trailers and are made with the quality craftsmanship that clients come to expect from Moduline. The great thing about this line is the fact that the pre-designed configurations are designed for mobile environments. All Moduline Cabinets are built to stand the test of time and there is an option to fit every need out there. Our durable cabinets can survive travel on the road while also providing a necessary safety feature that other cabinet materials often cannot. The military-grade, lightweight aluminum used in Moduline Cabinets doesn’t weigh your vehicle down. When you need to make a complete stop, you can. We have spent decades developing our military-grade aluminum cabinets and stand by our work. At Moduline Cabinets, we are fully committed to delivering the best aluminum cabinets in the industry. We have a wide range of cabinets including mobile storage cabinets, custom trailer cabinets and lightweight cabinets. Ready to get started? Moduline Cabinets is happy to provide you with a consultation with one of our cabinet experts. Call us at 888-343-4463 for a complimentary design consultation today!